We’ve made a case or two (or three, or five) for how important presentation packaging is to the retail market. Custom retail boxes adorned with the trappings of luxury packaging are the eye-catchers and head-turners of brick and mortar stores. Think about it–how many times have you been drawn to some creative or colorful packaging only to find out it’s something you’re not in the market for. But maybe you became in the market for it. That’s how it works. At Sunrise, we consider premium retail packaging is the first line of offense in a good marketing strategy. (It’s also the first line of defense in theft-protection, if you want to get technical.) Wow your audience at the very first site. Dotcom Distribution’s Maria Haggerty’s stance on internet retailer packaging is fueled by points similar to the case for standard retail packaging. The main point seems to be that no matter the source, packaging for e-retailers needs to fulfill the same goals. Turn heads and catch eyes. Add value to the product within. Make you as a consumer feel good about your purchase. Even when you know what’s inside, there is something sort of empty about tearing into a plain cardboard box. Haggerty goes on to mention how important premium packaging is to social media. From unboxing videos to packaging damaged in shipment, retail packaging makes its way into social forums. When a box is beat up in transit, most of the time folks will take to social media, telling their story and even posting pics to Facebook, Twitter, etc. Haggerty believes this tradition of only posting the bad can be combatted by high-quality and highly creative packaging. Something that’s worth posting just because it’s beautiful or cool. It’s true that people generally find it easier to complain than to boast about products and their packaging, but high-end luxury packaging could be a turning point for that sentiment. It’s tough to take a side on this one. On one hand, we couldn’t agree more that custom boxes and presentation packaging are a crucial element to sales and marketing a product. On the flip side, it’s hard to deny how perfect corrugated cardboard packaging (aka the old reliable brown box) is for shipping. Ships in flat-packed bulk to start, cushioned along the way, and ends up being recycled thanks to its naturally eco-friendly nature. Of course, there are middle of the roads to this issue. 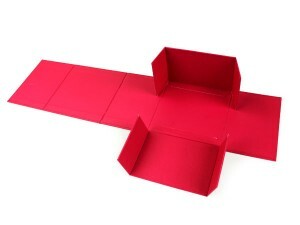 Our instant rigid boxes, for example, ship flat, but have all the adornments of luxury packaging. E-flute is a corrugated product that can be nearly as flashy as chipboard. And if you’re looking to keep packaging green (a selling point in of itself) there are options such as soy-based inks and aqueous coatings. 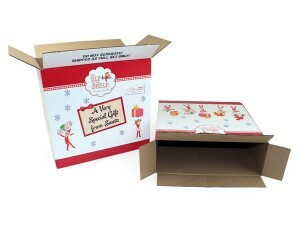 What it comes down to is that packaging can make a product appear to be a gift–even if it’s a gift to yourself–and there’s a certain pride and joy that comes from opening a gift. The retail arena knows this, and it’s time the e-retail business catches up.